GE: When Will Shares Become Attractive? To say that General Electric (GE) has had a difficult year would be an understatement. Shares of the industrial conglomerate have lost over 40% of their value year-to-date. GE’s fundamentals have deteriorated in 2017, and the decline accelerated in the most recent quarter. 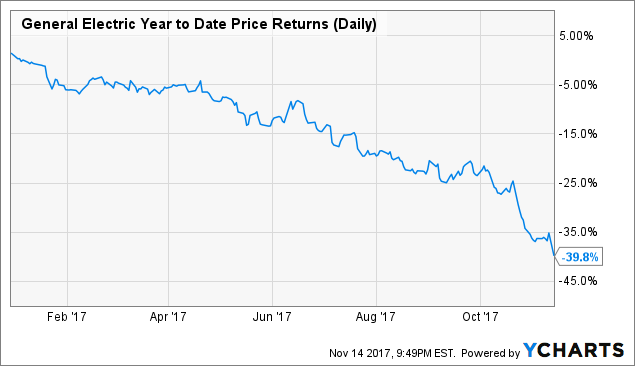 GE has performed so poorly this year that it made the difficult decision to cut its dividend by 50%. The dividend cut, while painful, allows GE to reset its capital allocation program. Along with cost cuts, it will free up billions of cash that GE can invest to improve its under-performing businesses. GE has been in operation for more than 100 years. Prior to the dividend cut, GE had a dividend yield well above 3%. These qualities placed GE on Sure Dividend’s list of blue-chip stocks. You can see our entire list of blue chip stocks here. It is reasonable to question whether GE still deserves recognition as a blue chip. But it is important to remember that GE is still a highly profitable company, with growth potential. If the stock continues to drop, it could soon become a value opportunity. At its 2017 investor meeting, GE announced a number of new policies. First and foremost, it cut its quarterly dividend by 50%, to $0.12 per share. GE also lowered its earnings guidance, below analyst consensus. For 2017, GE expects earnings-per-share of $1.05-$1.10. For fiscal 2018, GE expects adjusted earnings-per-share of $1.00-$1.07, compared with analyst expectations of $1.14. GE has gotten to a position where it simply isn’t growing. The company had become a lumbering giant, with an overly complex web of businesses that could no longer be managed effectively. GE will focus on three core businesses for growth: health care, aviation, and power. This makes sense, as these are GE’s three largest businesses, together comprising over 50% of annual revenue. These three businesses also have the strongest growth prospects moving forward. As a result, while there was not much for investors to be encouraged about from the investor update, GE’s portfolio trimming could help position the company for a return to growth down the road. GE’s strongest areas of growth moving forward are health care and aviation. The aviation and healthcare businesses posted 7% orders growth last quarter. GE’s industrial backlog grew by 3% for the quarter, to $328 billion. 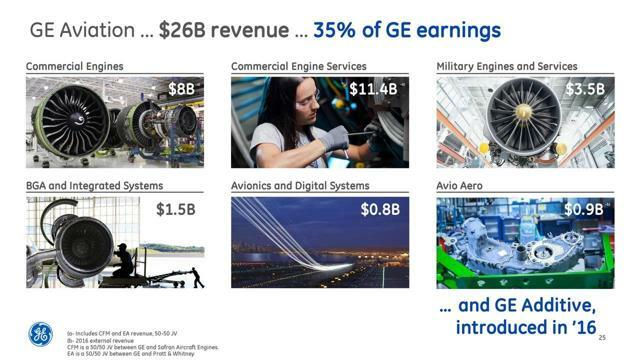 GE’s aviation business is the flagship of the industrial operation. 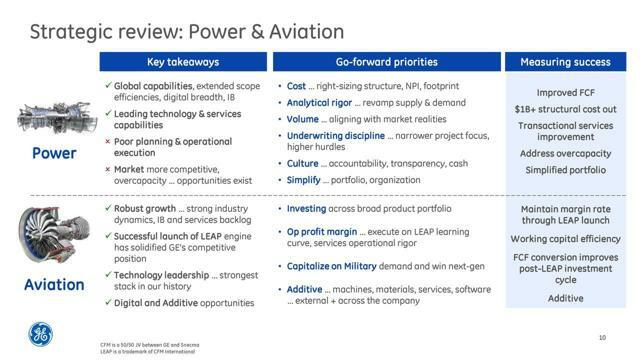 At the same time, GE is hoping to improve performance in the power business, while continuing the strong performance of the aviation business. These two areas will fuel GE’s long-term growth. GE will also utilize asset sales to streamline its portfolio. The company will shed $20 billion of low-growth businesses over the next one to two years, such as transportation and lighting. The positive aspect of GE’s asset sales is that the company can improve its balance sheet. GE is targeting a net-debt-to-EBITDA ratio of 2.5, which would be a healthy amount of leverage. An improved balance sheet would help keep GE’s cost of capital low and further reduce the burden on the company’s dividend. The turnaround initiatives and cost cuts will help the company become more efficient. Management expects as much as 3% organic revenue growth in 2018, including 7%-10% growth in aviation. If GE’s earnings bottom out and return to growth, the stock could be an attractive value here. GE stock has lost over 40% of its value year-to-date. With such a huge decline, value investors might begin to view the stock as a buying opportunity. GE might not be there yet, but it’s getting close. Based on the midpoint of fiscal 2017 earnings guidance, GE stock trades for a price-to-earnings ratio of 16.6. 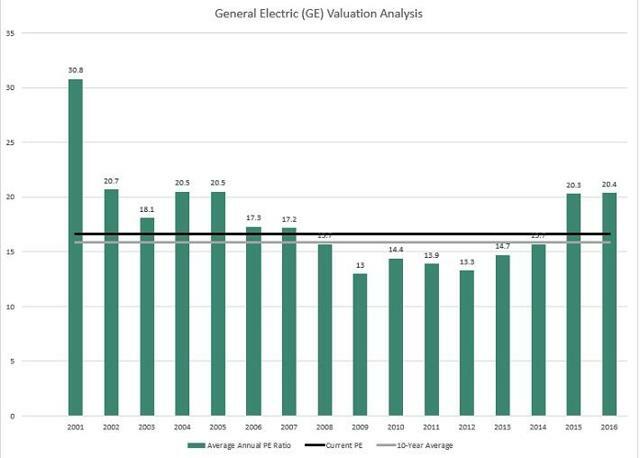 GE is still valued slightly above its 10-year average price-to-earnings ratio, of 15.9. As a result, it would not be surprising if GE shares continued to fall. Investor sentiment has become very pessimistic, meaning GE’s valuation could continue to contract. However, at some point GE would become attractive. If GE traded at its average valuation over the past 10 years, it would have a share price of $16.45 based on the midpoint of 2018 guidance. This price is approximately 8% below the November 14th closing price of $17.90. From a dividend perspective, a 3% dividend yield would be an attractive entry point for GE. At the new annual dividend rate of $0.48, this would result in a share price of $16. Therefore, there is potential for further downside for GE stock. But at a price near $16, the stock is attractive on the basis of valuation and dividend yield. Based on this, total returns could reach approximately 6%-8% per year. The new quarterly dividend rate of $0.12 per share works out to a $0.48 per share annual payout. This is a 50% dividend cut, but will save GE approximately $4 billion per year. GE’s right-sized dividend is more in-line with the cash flow of the company, given the massive divestments that have taken place over the past year. The bad news is the dividend yield drops significantly. GE’s forward dividend yield is 2.7%. 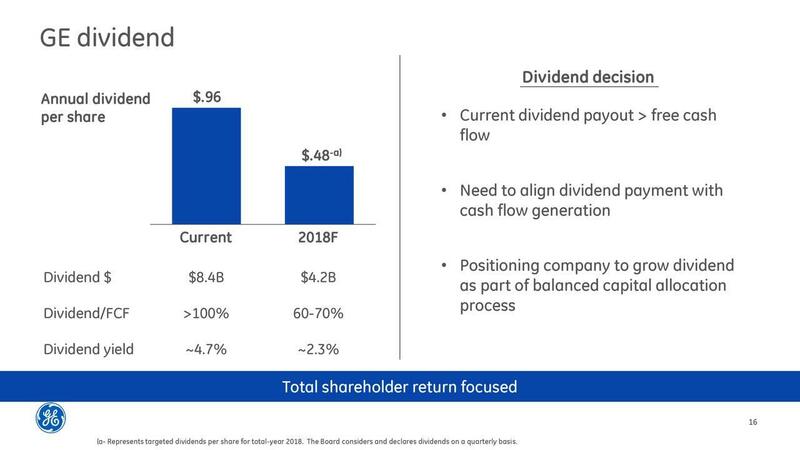 The good news is, GE’s new dividend has much better coverage than the previous payout, which took up more than 100% of free cash flow. GE needed to cut its dividend. After the massive sale of multiple financial businesses as well as poor performance in power and oil and gas, the dividend cut was necessary. The new $0.48 per-share annual payout represents a free cash flow payout ratio of 60%-70%, which is manageable. In a previous article, I argued investors should avoid GE at least until the results of the November 13th investor meeting. At that time, I stated that if GE were to cut the dividend, the stock could fall to $18 or below. Dividend cuts are typically accompanied by a drop in the share price. Sure enough, GE did cut the dividend, and the stock has indeed fallen below $18. At this point, it is reasonable to wonder if the selling is overdone. After all, GE is still a massive company and is an industrial giant and economic bellwether. If GE continues to decline to a 3%+ dividend yield and a price-to-earnings ratio in the mid-teens, the stock becomes more attractive. There is no doubt that GE has struggled over the past year. The reduced guidance and dividend cut are a disappointment, and are a reflection of the company’s poor financial performance. However, GE is not a doomed company. It remains one of the strongest brands in the U.S., with a leadership position across multiple industries. GE is still a profitable company, and its turnaround initiatives will help slim down the company for an eventual return to growth. The balance sheet is in better shape as well. While there could be further downside risk for the shares, given the highly negative sentiment right now, at some point GE will become an attractive value. There are many industrial stocks with longer histories of dividend growth than GE. Find out which ones are confirmed buys or sells with our service Undervalued Aristocrats, which provides actionable buy and sell recommendations on some of the most undervalued dividend growth stocks around. Click here to learn more.